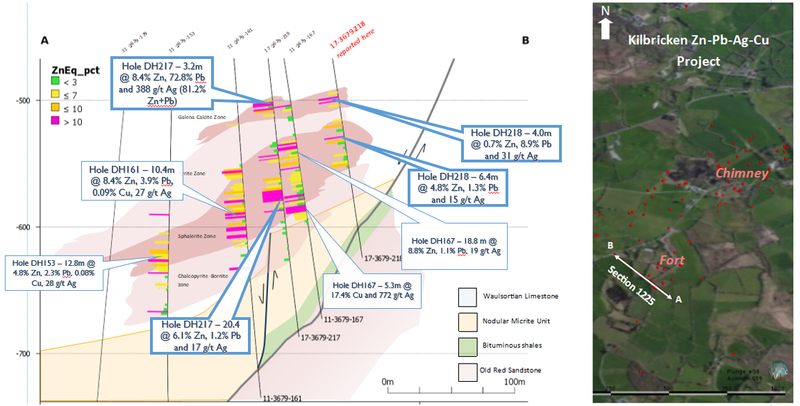 Vancouver, Canada – Hannan Metals Limited (“Hannan” or the “Company”) (TSX.V: HAN) (OTCPK: HANNF) is pleased to announce drill results from the second hole completed in its resource expansion program at the 100%-owned Kilbricken zinc-lead-silver-copper deposit in County Clare, Ireland. Thirteen holes are planned in this 8,500 metre drill program, scheduled to be completed during the first quarter of 2018. Two holes have been completed by Hannan at Kilbricken, and one in progress for a total of 1,986 metres. A 8,500 metre resource expansion drill program is ongoing, with two drill rigs now at site to test along strike and down dip from the mineral resource area (Hannan Press Release, 10 July, 2017 ). Drilling will continue through to Q1 2018.